You may or may not have noticed I have re-vamped my blog. I think this reflects my style better. The fact that I only had a right hand sidebar used to annoy me (I have a thing about symmetry) and now I've added a labels search bar, and a widget to show which posts are most popular each week. Let me know what you think about my new layout, and if you think there is anything I should change or add, by leaving me a comment. Or you can drop me an email at trulypolishedblog@gmail.com. 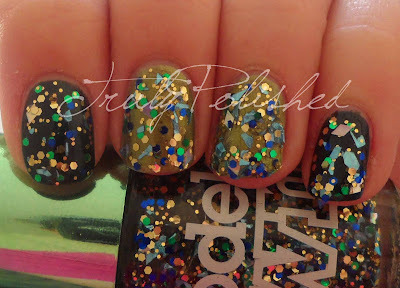 Anyway, as promised, here are my swatches of the Models Own Mirrorball Collection! This is my first time posting a whole collection at ones, and editing these photos took me AGES, that's why this post is so late, but it needed to be done. I won't go into huge details about each colour, they were all very alike formula wise. Great formula, I didn't need to dab anything on. The polishes dried really quickly, and relatively smoothly considering they have such huge pieces of glitters in them! 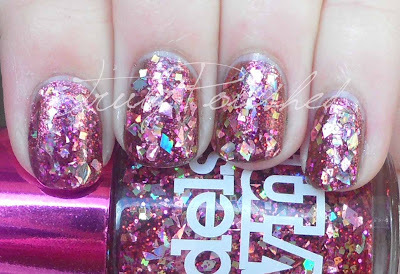 What I love about this collection is the shard type glitters. 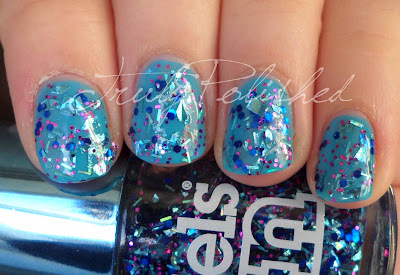 Each polish has a shard shape and they're colourful holographic glitter shards! They are so gorgeous! I decided to make this post exclusively Models Own, so the layering colour is also Models Own in every picture. 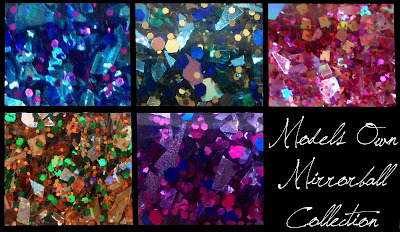 I layered two layers of glitter over the base colour in each photo. 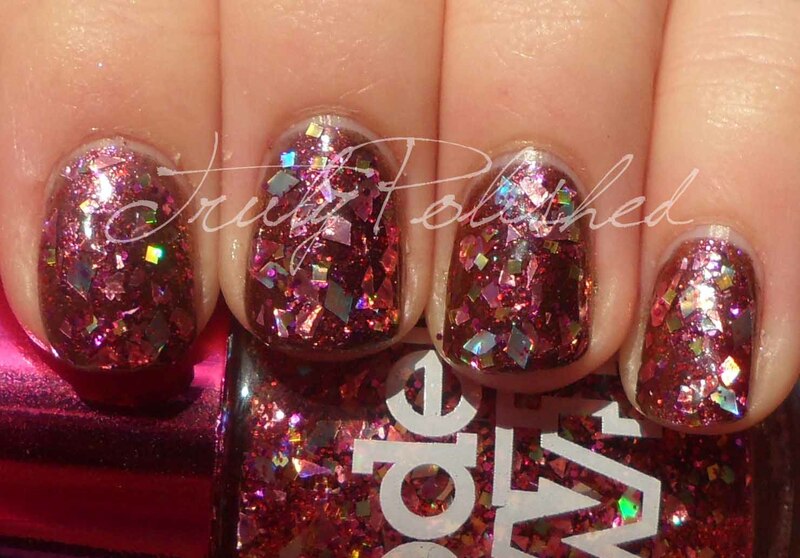 All photos are without topcoat. Before I start the swatches, here is a collection of macro shots from the bottles! Aren't they so beautiful? I love bottle macro shots, they really show off the glitter combination and give you an idea of possible layering undies! Click "Read More" to see swatches of each individual polish. 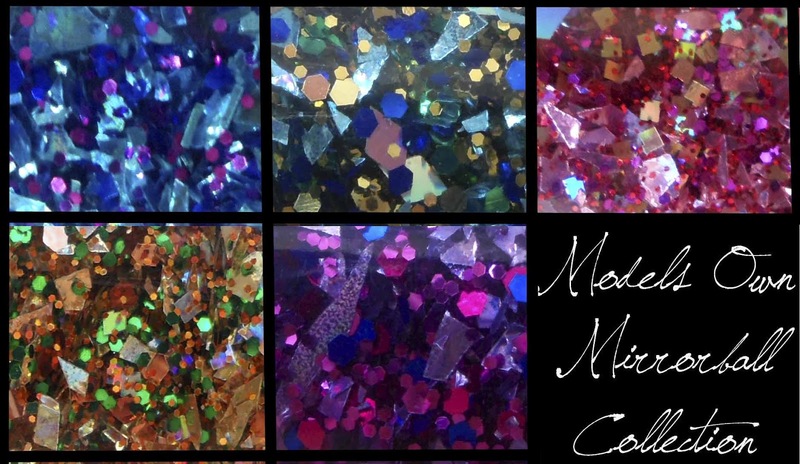 This is a selection of aqua holographic shard glitter, silver holographic bar glitter, with small purple and blue hex glitter. I chose to layer this over Balearic Cool. This has pale blue shard glitter, green blue and gold hex glitter and gold small hex glitter. There are also silver diamond glitter pieces. I layered this over Beetlejuice Emerald Black on the index finger and pinkie and Golden Green on the middle and ring fingers. 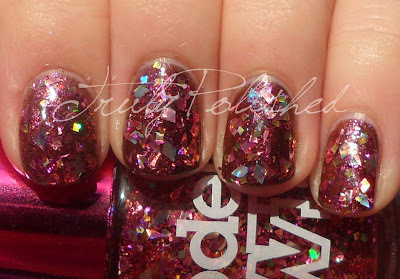 This has pale pink holographic shard glitter, silver holographic diamond glitter, gold square glitter and red microglitter. I layered this over Beetlejuice Pinky Brown. 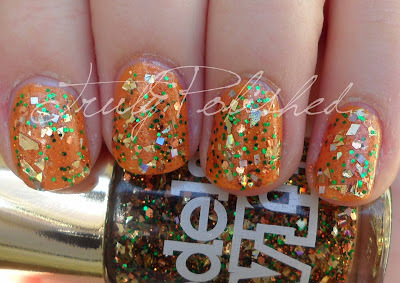 This has gold holographic shard glitter and green and orange hex glitter. To me this glitter mix screams both Halloween and Christmas, but as it's only October, I went for Halloween! I layered this over Zest-A-Peel. 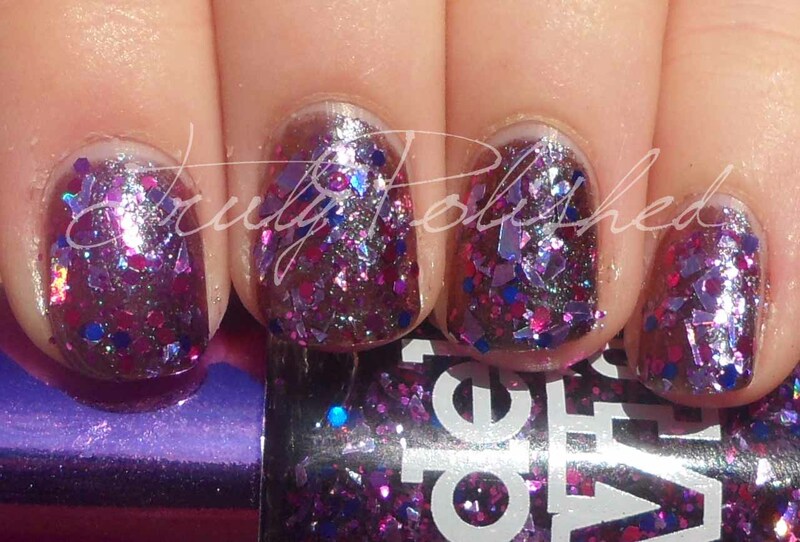 This has lilac holographic hex glitter with lilac bar glitter, magenta and blue medium hex glitter and pink small hex glitter. I layered this over Beetlejuice Purple Blue. So there we have it, the Mirrorball Colelction. This is so beautiful, I'm so glad I bought it. 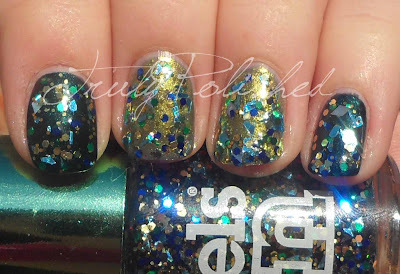 The glitter combinations are different to anything I have already, and the limited edition metallic caps make them even more special! 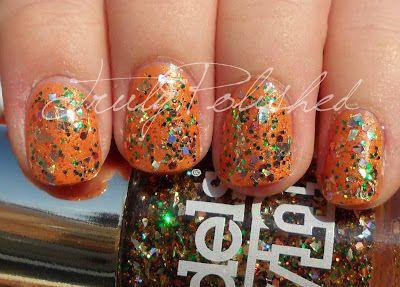 The Mirrorball Collection retails for £5 per bottle here. It's currently out of stock but will be back online and in stores on October 4th, so not long to wait! These beauties are definitely worth a purchase. 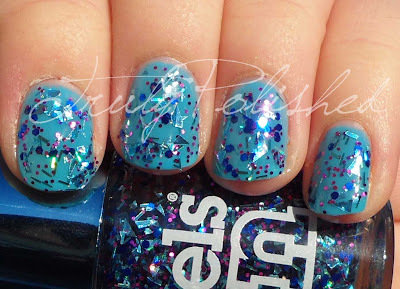 I don't know about you, but when the weather gets worse, I like to cheer myself up with some glitter! 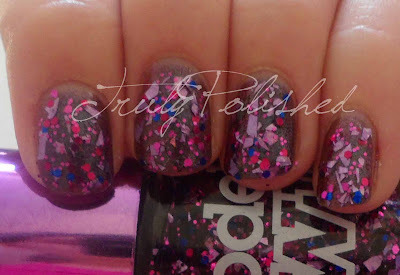 oh gosh Freak Out is such a fitting name- it's amazing!! I love it, it's definitely one of my favourites from this collection!